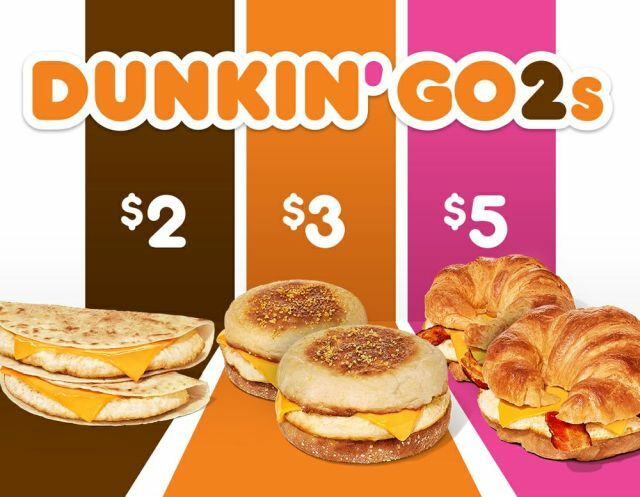 Perhaps taking inspiration from McDonald's McPick 2, Dunkin' Donuts launches the Dunkin' Go2s value menu where you can get two of the some of the chain's most popular (or "go-to") breakfast sandwiches at the $2, $3, and $5 price points. The sandwiches and deals are available all day. You have to buy two sandwiches to get the promotional pricing. Dunkin' Go2 is available for a limited time at participating locations. Dunkin' Donut will also be running a sampling event where you can try a free 3.5-oz cup of their Cold Brew coffee on Friday, April 6, 2018, from 10 AM to 2 PM at participating locations nationwide.